Description	 MS palimpsest on vellum, Mt. Sinai, Egypt. 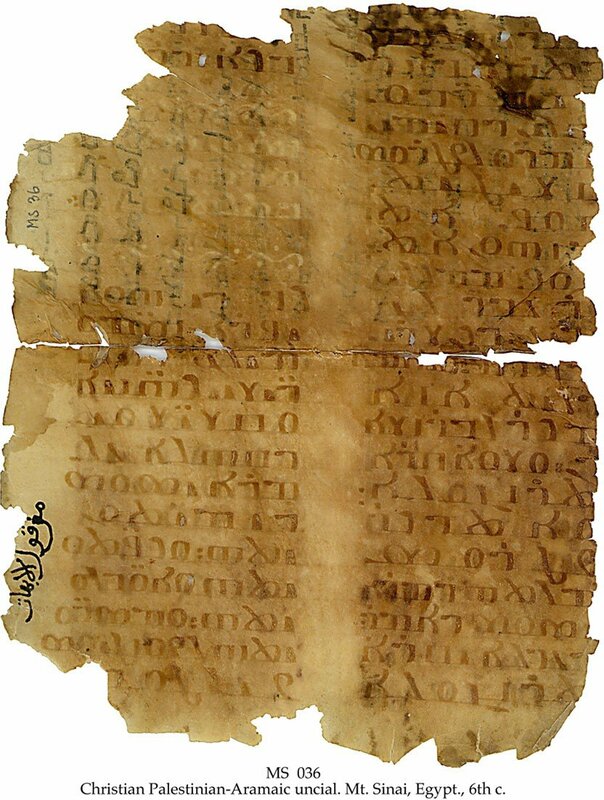 Text 1 (underlying text): in Christian Palestinian-Aramaic, 6th c., 1 1/2 ff., 20x16 cm, originally ca. 24x18 cm, 2 columns (19x14 cm, originally ca. 21x14 cm), 22 lines (originally ca. 24 lines) in Christian Palestinian-Aramaic uncial. Text 2 (overlying text): in Syriac, ca. 700, 3 ff., 16x10 cm, single column, (15x9 cm), 15 lines in a somewhat shaky Syriac estrangela book script, with similarities to Mt. Sinai Cod. Syr. 30, dated 698. Binding	 Barking, Essex, 1990, green cloth gilt folding case, by Aquarius. Another 35 ff. = MS 35, and 1/2 f. (1 f.) = MS 37 are possibly from the original codex of 6th c. 16 1/2 ff. (33 ff. ), also from the same codex, in St. Petersburg, The National Library of Russia (mostly St. Cyril: Catacheses), brought to St. Petersburg from Mt. Sinai in 1859 together with Codex Sinaiticus by Konstantin von Tischendorf. Further MSS from Mt. Sinai see MSS 35, 37, 571-585, 613 and 2530. Provenance	 1. Monastery of St. Catherine, Mt. Sinai (6th-19th c.); 2. Friedrich Grote, Germany (ca. 1900); 3. Private collection, Berlin (1929); 4. D. MacLaren; 5. Sotheby's 12.4.1954:302; 6. Dr. Otto Fisher, Detroit; 7. H.P. Kraus, "Monumenta Codicum Manuscriptorum" cat. (1974):2; 8. H.P. Kraus cat. 165(1983):28. Commentary	 Underlying text: Gospels of 6th c. in this rare language, closely related to the mother tongue of Christ, are of considerable textual interest. The script is together with the nearly identical one in "Codex Climachi Rescriptus", Mt. Sinai, mid 6th c., considered the finest and earliest specimen of Christian Palestinian-Aramaic uncial extant. The script is also known as Palestinian Syriac book script. Apart from the 3 MSS. in The Schøyen Collection, only the Vatican, St. Petersburg and Mt. Sinai libraries have MSS in this language and script, and even the Mt. Sinai library has only 3, all from 11th c.
Published	 Underlying text: Alain Desreumaux: Codex sinaiticus Zosimi rescriptus; Description codicoligique de feuillets araméens melkites des manuscrits Schøyen 35, 36 et 37. In: Histoire du Texte Biblique 3. Lausanne, Éditions du Zèbre, 1997.